The ceremony drew more than 300 local officials and soldiers as well as tourists who sang the national anthem together to welcome the New Year 2019. Huynh Ngoc from Tuy Hoa city of Phu Yen, said that this is the second time Ngoc and friends have joined the ceremony in the place that welcomes the first sunlight of the country. “I am very proud to sing the national anthem on the first day of the New Year,” stated Ngoc. The national flag saluting is an annual event held by the People’s Committee of Phu Yen as part of patriotism education activities. 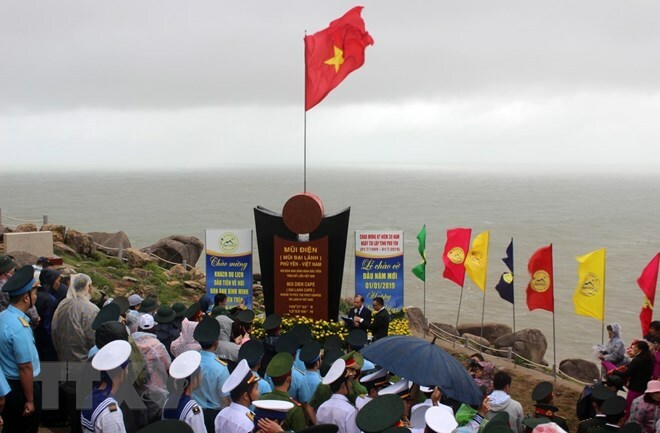 On the occasion, Phu Yen also held a ceremony to welcome the first 100 tourists to Bai Mon-Mui Dien national tourist site. Phan Dinh Phung, Vice Chairman of the provincial People’s Committee, said this year, the province will hold various cultural and art events to mark the 30th anniversary of its re-establishment and lure more tourists.